If you have your own blog, then Earn Money with Google Adsense Program. There are numerous ways to make money from the internet, but most of the thing requires much work and time. Out there in the internet ocean, creating a blog and monetizing with Google AdSense is the best-proven success formula for many bloggers to earn money with Google. Google AdSense has created many billionaires around the world, and still making millionaires. Join with them towards the Goal of financial free future and unleash the deeply hidden potential of unlimited income every month. Here, let’s go something deeper to know some ways to get some cash from Google while we are on the Internet. Let’s pay our next Internet bill from our earnings, simply make Google pay our next bills. Surprised..! Ha! It is neither simple nor a difficult task to do. But with little dedication and involvement in your work, you can dig the deep potential behind online to earn real money every day. It all happens with only if you have an own website or Blog to share or promote anything and a little knowledge of content monetization technique. 1.) 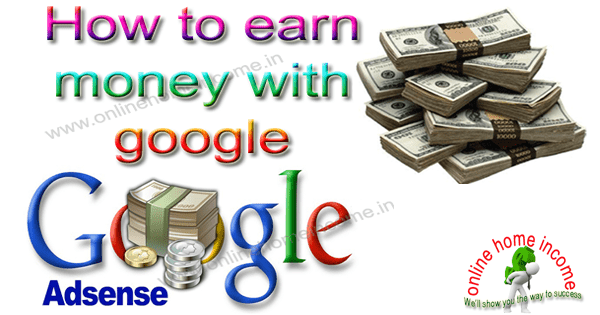 How to Earn Money with Google? All people want to make some extra revenue to make their living. Let us start with an example, imagine you are a wholesale dealer of shoes and having a domain that sells Shoes online. In this case, probably your domain will have a home page, about us page, product description page, contact us page and so and so. You will have some contents in there to let people know who you are? What do you sell? Now your website has some decent traffic and if you planned to earn some money just from your website then you can add Google AdSense. Google AdSense is a revenue sharing program that sells advertising space on your website on your behalf and when someone clicks on those ads, you will earn some percentage of the revenue generated through the ad. For better knowledge, I will point you one thing. You may see these types of ads on the top of the Google search engine result pages and even in your Gmail account. All these ads are Sponsored Ads from Google Ad words, and the same to your own website is termed as Google Ad sense Ads. When someone clicked on those ads you will get 68% of the revenue from that Ad. It is not a Get-Rich-Quick-Scheme as it requires some time and effort. If you have more contents on your blog, more chances to earn from Google Ad Sense. 2.) What is Google AdSense? This program is specially designed for blog owners or website publishers who want to earn money with Google by displaying targeted text ads, video ads, or banner ads on their web pages. » Whenever a visitor views or click the ads, some percentage of money will be paid to the blog owners. Placements of Ads relevant to the content, changing advertisers are entirely controlled and managed by Google. As a web publisher or blog owner, we simply need to create a free account with them and create the ad code and copy the HTML code and paste into your blog pages. 3.) How does Google Adsense work? First, let me explain to you how Google AdSense works and how you can earn money with Google AdSense?. 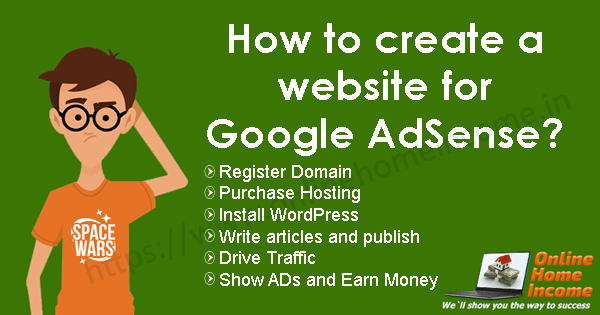 Google AdSense owned by Google is an advertisement service offered to bring a chance for making money for website publishers and/or blog owners. If you run a niche blog or website, then you can monetize your blog pages with AdSense to make some money. Every time when the ad gets clicked by your site visitors you will earn the commission. The first step is to create a free account in their program. Use your Gmail account to create. google wants to review your blog to check if your follow their Guidelines. So, after application you need to create an AD, then copy and paste the HTML code on your blog page. So, Google can crawl your blog content and once your adhere to their program policies your account will get approved automatically and ads start showing on your pages. 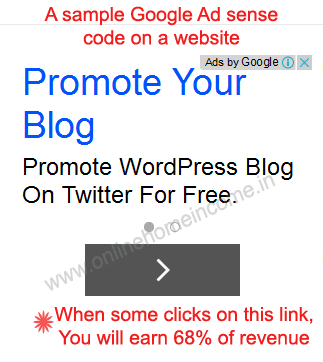 Once your account is approved, AdSense ads start displaying on your blog pages. Now you need to add your payment instruction to get your payments. They pay once you reach a minimum of $100 in your account through Direct Wire transfer or Cheque. 4.) How do you make money? Revenue is generated based on the total number of unique clicks or unique impressions that your displayed AD receives in every 24hrs. Unique clicks only will be calculated for revenue distribution. To earn money online with Google AdSense, you need to register a free account with their AdSense program. Log in to their account, copy and paste the HTML AD code in your blog pages to monetize. There are lots of different kinds of ad formats are available with the Google Adsense program such as text link ads, banner ads, animated gif images, flash banners etc. You will earn money with Google every time your ad gets clicked or viewed by your blog visitor. You will make money irrespective of whether a sale was made or not for the advertisers. You can earn almost from $0.001 to $10 as far as I heard somewhere but actually, you will get $0.001 to $1 for every click and it solely depends on the advertiser who pays. One cannot estimate how much we can earn from Google Ad Sense? But I am sure you can earn a decent income to pay your bills often. 5.) How much does Google pay per view? Let’s make a simple calculation that if you want to make $1000 next month. You are having 30Days in a month. So, $1000 divided by 30 = $33.33 a day. You want to earn $34 approx. Every day to cash out $1000 next month from Google. Isn’t it? In the above calculation, your target is $34 to earn every day for cashing out $1000 at the end of the month. Note: Google never considers the number of blog pages, create quality posts on your blog. It’s not necessary to create 136 pages to make $1000 every month. Some blogs with lesser quality pages have earned more than $1000. Google will pay for your ads based on CTR (Click through ratio) calculation and in general an average CTR to sail on the safer side would be 1% and your CPC will be $0.25. The above screenshot represents average earnings of my AdSense account. Now you have some clarification on How Google pays yours for Ads. No one can predict the earnings for a blog and it purely depends on your Niche and competition. Some of the High Paying CPC niches for AdSense are Finance and market, Mobile technology and software, Recipe sites, Insurance sites, health info blogs etc. You can get the complete list of various types of blogs that makes money in this article. On the other hand, low paying CPC niche was grouped as Entertainment sites such as Arts, movie review blog, music download sites, wallpapers, Jokes and SMS, News blogs, Quotes, Photoblogs etc. As mentioned earlier if you want to cash out $1000 a month so you need to earn $34 a day and your average CPC is $0.25. You need 1000/0.25 = 4000clicks in that month to earn $1000. So, approximately 134clicks every day. In general, only one/third of your site visitors will be converted and hence you need 134 x 3 = 400Unique visits every day. So, think 500visits a day to your blog will earn you $1000 a month. 6.) How much money can you make? It is a very common question that everyone wants to know. No one can estimate exactly how much one can earn money with Google as it depends on various factors of monetization. • Place 1 ad unit at the end of your article. These three locations are proven to drive most clicks which will help you to increase revenue. 7.) What are the ways to make money? There are multiple ways for earning money with Google. All you need to have your own blog that interests your users in some ways and must have a steady flow of traffic every day. 8.) How to create a website for Ad Sense? You have come to know all the aspects to earn money with Google through their AdSense program. But in every section, I have said you must have a blog. Now, let’s see the process of how to start your own blog for making money? Already I have explained in the previous article about the steps involved in starting your own blog for money. However, I will summarize here important points so to give you an idea. The very first step is to start a blog on any trending niche that you know about. You can start any blog in various sectors like a review blog, an article blog, an education blog, and niche blog on make money online, affiliate marketing, referral marketing, etc. The first step to begin this process is to identify your passion because, without interest or knowledge, you cannot write articles. Basically, the blog is a resource of information usually written at a frequent interval to engage the audience in a community. For the example, Online Home Income was started to teach people about different ways of making money by doing online jobs in the computer at the home. Here, I use to write articles about different money making options if I found them useful and worth. So know your passion first. Then, based on the passion, you should have to find a keyword rich domain name to start this business. i.) Very first initial step in this process is to register a domain name based on the passion. which will tell you what are you having on your blog? ii.) It should be easily memorable, and name should be interesting. Make a thorough Google search about the niche you chose for a blog, and analyze its trend and future scope. I can give you some suggestion that you can blog for cooking, painting and photography, SMS & jokes, Business ideas, and Tips blog etc. This will have high future scope in terms of search and you will get a good volume of traffic every day. Click here register a .COM domain name at our store. After your domain registration, you need an internet server to host your website. This is the location where your website contents will be served to the entire world. There are four types of hosting you can choose to start a blog and they are, shared hosting, virtual private server hosting, dedicated hosting and cloud hosting. Shared Hosting: Your blog/website will be hosted on a common shared server. Less cost and resources are limited. Virtual Private Server Hosting: A portion of the physical is allocated for you to host your blog/website. Little expensive and more resources available. Dedicated Server Hosting: The complete server is dedicated to hosting your blog/website which is costlier. Cloud Hosting: Portion of the physical server is allocated and can be increased or decreased based on the resources. Click here to buy hosting starting at $2.95 per month. Affordable Price: Choose to host that won’t burn your hands on paying their monthly charges. Reliable hardware and supporting software: Web server must have inbuilt good quality hardware components such as Hard Disk, Ram, Virtual Memory Space, Bandwidth along with the latest version of software such as cPanel, Linux OS, MySQL, PHP versions etc. Data center Location: If your server is located nearer to your demographic location your website speed will be higher which will help you to get better ranking. Choose your target visitors and their location, purchase hosting from that location. Eg: If you are from India, then purchase a hosting in Indian Data Center. You can go with GoDaddy India, Hostgator India, Blue Host India. Reputation – satisfaction – customer service: Your website should be live 24×365 days with almost zero downtime. Consider these factors are more important because whenever there is an issue on your server it should be addressed immediately and sorted out to make sure your website serve your visitors anytime. Future support: Your server must allow space to increase its hardware or software structure at the time of need. As your website grows, it will consume more resources and your server must be able to supply its need. I recommend to go with an own website and hosting because you can have full control over your domain. Choose a well known hosting like GoDaddy, Bluehost etc., and trending domain name to target. After purchase and registration of domain and hosting, login to your cPanel to setup your WordPress CMS to start blogging. WordPress is considered the world’s best CMS that is easy to use even for newbie’s. Their GUI interface makes even newbie design a beautiful website with just a few mouse clicks. I have explained this process in the other article here as I don’t want to mess here everything. Now, time to write articles. Choose your niche keywords and search for its competition around the net. Write quality articles around your niche keywords and start publishing contents regularly. Keep your blog updated more frequently by creating a Fresh and unique content in your blog or website and increase traffic using Social platforms such facebook, twitter and follow some SEO strategy to get some organic traffic from Google. Once your blog starts receiving a decent steady flow of traffic from different sources, its time to apply for AdSense program. After approval login to your account. Copy and paste the provided HTML code into your blog page. Now, Google Ad sense will take the rest to show advertisements related to your contents and thus pay you 68% of Revenue generated through your website. Most bloggers seem that their application being rejected because of their strict policy and guidelines. Follow Google Webmaster Guidelines and make your site Google Friendly. • The website was very new. Make your website popular and add more quality contents regularly. Google has very strict policies that every web publisher should follow to make money from Google AdSense. • Copy and paste your test AdSense code in your blog in above the fold content after signing up your application. Earn money with Google AdSense is a great way to generate a residual long-term income over months. It’s really easy to use, it’s reliable and better than any other monetization method. Different types of Ad units are available to support you to generate more revenue. There is no necessity to make a sale for your advertiser, just making your visitors click on their ads itself will generate revenue. Google shares 70% – 30% of the revenue generated, where 70% of the income will be paid to you and 30% will be the Google’s share for administration and maintenance. If you don’t have an account, start making one today and try this method for free. Hope for the better future. Are you interested to start a blog for Google Adsense or Affiliate Marketing? Online Home Income extend its support to those spiritually minded individuals. Start a blog today with me (MYILRAJ G) and make a decent income every month. Join my 2018 Resolution and become an Entrepreneur.